A Tribute To John L "Ace" Holman, Jr.
W. K. Dunbar, President Morse Telegraph Club, Inc.
You had asked me to furnish a brief biography for your use in submitting my name for confirmation as director. It follows - I've tried to be (uncharacteristically) brief with the thought that fat is always easier to add than subtract. I was born Dec, 8, 1926 in Wilmerding, Pa. which is a small mill town just east of Pittsburgh and home of Westinghouse Airbrake. It was in New York City during the mid-thirties that my interest in telegraphy and radio formed. This was mainly due to the influence of my father and his close friends. Pop had worked, some years earlier, as an agent operator for the Arizona Eastern, near Safford, Arizona, and later for the Western Union in New York. His friends were still active in the trade, at that time. We moved to Philadelphia in the late 30's. It was there that I received my class B ham ticket, W31NV in January of 1940. Two years later, I graduated from high school. Prior to graduation I had sized up the job market open to too-big-for-their-britches kids. After being told by Western Union ( or was it Postal- they were still in business then) that they couldn't use me because (a) I was only sixteen end (b) I didn't own a bicycle, the Long Lines Department of A T & T hired me as an Equipment Attendant at the princely sum of $18.00 a week,. Long Lines was glad to get me, I suppose, because I knew a little of telegraphy and radio, having had my ham ticket for two years then. Not being of draft age for another two years didn't hurt, This was in February of 1942 and we had just gotten into WW II. It wasn't tough to find a job in those days if you wanted one. 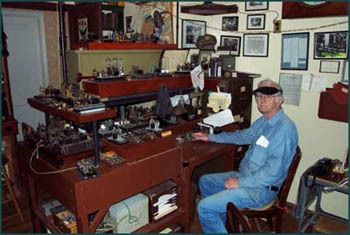 Morse was used extensively in this era for circuit maintenance and internal administrative purposes. All of us new hires in the Plant Department were required to take instruction in Morse. This occupied an hour of each working day, regardless of your shift. Even on 3rd trick (our "A" tour - midnight to 8 AM), we were obliged to copy the practice wire under the scrutiny of the night supervisor. My attainments as a telegrapher were pedestrian and unremarkable. A trouble report, a clearance, a test or put up a patch as the occ-asion arose. My principle responsibilities were in the maintenance of the equipment. As the telephone network grew and more voice circuits became available for use in order-wire service, the need for Morse declined and, by the mid-fifties had faded away altogether. Even among our leased-wire customers, only a small handful still used Morse. All this was at the Bourse Building in Philadelphia, a pebble-toss from Independence Hall. Sandwiched in all this was service in the Army from Dec. 1943 to May 1946 about evenly divided between the states and European Theater. Again, nothing noteworthy. It was obvious, though, after the war, that things were changing rapidly. Much of the old equipment had been scrapped, particu1arly the older te1egraph apparatus. It was then that I started seriously trying to collect and preserve what of it I could, instead of merely "acquiring" it for my own use. That which we had taken for granted for so long was fast disappearing. In those days, though, folks would give you equipment, if they thought you were interested in it. In 1956, several of us were sent to Wayne, Pa. , a suburb of Phila., to work on the installation and cut-over of the brand-new 4A toll switcher (now junked). From there, after a brief stint at Pittsburgh's "J" office, I went into the Wayne Division's 0ntside Plant Engineering group as a Technical Assistant. Following that, I went into the Wayne District as Staff Assistant, Outside Plant and, later on Private Line Services. This would have been in the early l960's. After spending a year in virtual exile to the 'woods' - phasing out jobs - I was able to take an early retirement at age 56 with 40 years of service 1982. Many years ago - perhaps in 1954 - a dear friend enlisted me in the old Morse Telegraph Club of America as it was called then. The demands of changing jobs and raising a family broke this thread and I lost touch with the Morse world. In the early 70's, however1 I was fortunate to be able to re-establish contact, and have enjoyed it since. It was indeed a singular piece of good luck to be able to associate with a number of other operators on a leased Morse wire in the Philadelphia area for a period of some ten years. 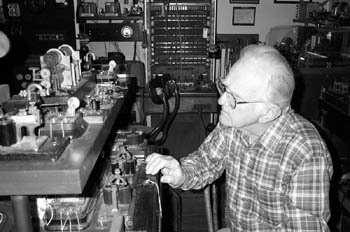 I'~ still fortunate enough to enjoy a short two-point circuit with my friend Frank Marshall. Since retirement, I've kept busy. Between Chapter affairs, trying to bring some order and coherence to a modest collection of Morse apparatus and paper and digging holes in my half acre mud puddle, there's little chance of boredom setting in. My ham radio activities have always been on CW., low power rag chewing for the most part. Although in recent years, on the air activity has been limited. I seem to spend more time in the shop taking things apart and putting them back together, trying to maintain at least a nodding acquaintance with technology. Sure could use a little more steam in the boiler.